There are two words that have forever changed the landscape of reality TV: "Real Housewives." What began as "The Real Housewives of Orange County," a 2006 show centered on the beachside lives of affluent women living in a gated community in California, has ballooned into a binge-friendly franchise that largely documents business women as they navigate friendships, breakups and raising children. "Real Housewives" now has reality television cameras rolling in New York City, Atlanta, New Jersey, Beverly Hills, Dallas and Potomac. It also tried a run in Washington, D.C. proper, which ended in one "housewife," crashing a state dinner and the whole production to be cancelled. And that doesn't include the spin-offs based on our favorite housewives, such as fan favorite "Vanderpump Rules," named after Lisa Vanderpump, a cast member on "The Real Housewives of Beverly Hills" and the recently announced "Kandi Koated Nights," a new half-hour talk show, premiering July 1, hosted by Kandi Burruss, a cast member of "The Real Housewives of Atlanta." Not to mention, the various spin-offs around the world, such as "The Real Housewives of Melbourne" in Australia, "The Real Housewives of Toronto" in Canada, and "The Real Housewives of Hungary," which just premiered last September. 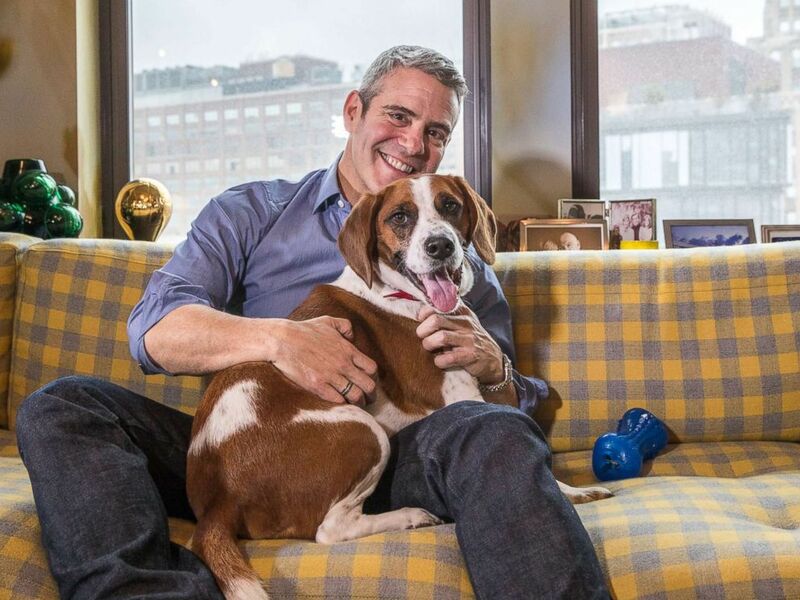 Andy Cohen poses with his rescue dog, Wacha, in an undated handout photo. Executive producer and host of Bravo's "Watch What Happens Live" Andy Cohen has been at the center of the shows, even hosting the reunion specials for the U.S.-based franchises where the housewives sit in a ornately decorated room for hours to discuss -- and let's face it: argue -- about what went down that season. Cohen, 50, a spokesman for PurinaONE and their recent 28 Day Challenge, spoke to Good Morning America and graciously answered every single question we had about "Real Housewives" and other Bravo shows we love. 1. Have you talked to Gregg Leakes or Nene Leakes after the housewife revealed Gregg's cancer diagnosis? "She and I have traded messages," Cohen said, referring to Nene Leakes, "and I sent him a bunch of books. I know she’s with him now and you know, we’re all just praying for Gregg. We really love Gregg." 2. What guest -- that you haven’t had -- would you want to book on "Watch What Happens Live?" "Well, we've been working on Michelle Obama." 3. Which "New York" cast member do you feel that you're the most like?" "Oh my God...that’s a really hard question. I am maybe Radzi," he said, noting former journalist Carole Radziwill. "I don’t know. I don’t know that I’m that like any of them." 4. Is there any housewife that’s left any franchise that you’d like to bring back? "Caroline Manzo," he said, referring to the housewife who left "The Real Housewives of New Jersey" after five seasons in 2013. The cast of "Real Housewives of Atlanta," season ten is Porsha Williams, Sheree Whitfield, NeNe Leakes, Cynthia Bailey, Kandi Burruss, and Kenya Moore. 5. Why hasn’t Marlo Hampton ever gotten a peach? "At first," he said, laughing, "we wondered whether it was a right fit. Nene was advocating her from the start and then she and Nene really fell out...and then Nene left the show and so I mean, it’s been kind one thing after the next." 6. What did you think about the now-defunct reality show that starred Marlo Hampton, produced by Kandi Burruss? "Kandi is a businesswoman so I thought it was cool. I got it." 7. Why does Kandi get a spin-off every season? Does she pitch herself or does she have something in her contract? "She doesn’t have anything in her contract. She's just a good businesswoman and she always has a lot of ideas and she’s also really passionate." 8. Have you heard Kim Zolciak’s new song "Wig"? What did you think? "I have. I got a kick out of it." 9. What did you think about Theresa Guidice having a hobby in body building? "I loved it. It was awesome. I thought it was amazing." 10. What ever happened to 'The People’s Couch'? People were so upset it got canceled. "I get more texts and tweets about that show, but I think the ratings were not that strong enough to make Bravo bring it back, to pick it up. It was fun for a couple years." 11. We know D.C. is the only franchise that never came back. Any ideas to expand to more cities? "I think we’re good right now." The cast of "Southern Charm," season five is Chelsea Meissner, Thomas Ravenel, Craig Conover, Shepard Rose, Cameran Eubanks, Kathryn Dennis, and Austen Kroll. 12. We saw the reports that Thomas Ravenel is facing sexual assault allegations. Was it his idea not to attend the recent 'Southern Charm' reunion? "It was a mutual decision." 13. What did you think of Ashley Jacobs’s meltdown on 'Southern Charm'? "I was stunned. I was stunned and it’s not her last meltdown of the season and what happens at the reunion is jaw dropping." Omg omg!!!!!!!! We are ENGAGED! What a way to start our summer and season 7!! I am so happy, so in love, and so beyond excited for this next chapter of our lives! I can’t wait for all of you to see how he proposed! I am the happiest girl ever right now. ???? love can win ???? #PumpRules thank you @kylechandesign this ring is gorgeous!!! 14. What did you think when you heard "Vanderpump Rules" stars Jax and Brittany got engaged? "I was both surprised and not at all [surprised]," he said. "I hope Jax doesn't blow it." 15. Why doesn’t Wacha come by the 'Watch What Happens Live' studio anymore? "Sometimes he’s there, but ... he’s usually sleeping in my office."